When I was leading my local Cycle Toronto ward group, Ward 19, we produced a report of six recommendations to the City to improve the cycling experience and safety on Strachan. Since then, amazingly, three of them have actually been implemented, thanks to support from Councillor Mike Layton. Local activist Nancy Smith Lea first got a promise from former Councillor Joe Pantalone almost twenty years ago to install a northbound traffic light for cyclists at Lakeshore and Strachan. When we asked Layton, it took only a couple years. It's amazing what happens when a local politician actually cares about the safety of people cycling. Yet, there is still so much more we can do with Strachan to make it safer. I still wouldn't take my mother for a bike ride on Strachan. My mother grew up cycling long distances in the south of the Netherlands to visit relatives in other towns. As has been pointed out by many, the Netherlands actually puts a lot of effort into building properly protected bike lanes. Strachan, on the other hand, represents an antiquated mentality among North American planners that a little bit of paint is all that is needed. These planners have ignored people like my mother; someone who would love to bike around when she visits me but encounters streets with speed, unpredictable cars, large trucks. Strachan is by design unforgiving of any mistake by a cyclist; any wobble that my mother might make could potentially be fatal. Strachan is an excellent candidate for transformation into a safe, comfortable cycling route. It doesn't have curb parking. It has wide lanes. It has painted bike lanes south of King. It is the only street with the potential to be a safe cycling connection for Liberty Village residents. 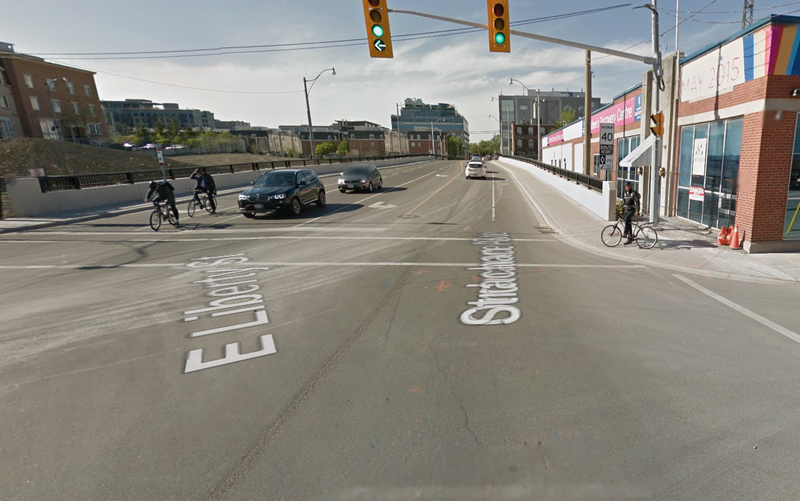 Strachan is one of the few streets that connects to the lake where getting protected bike lanes would be easy. It's already being used by a lot of people with few other options. And the numbers prove it. I went down to the corner of Strachan and Wellington last Sunday afternoon. From my half hour sample, there were 302 people on bikes per hour, and 928 cars and trucks. At least twenty-five percent of all traffic are bikes during a peak weekend afternoon, which is not nothing. In fact, this is pretty good when compared to other key cycling routes downtown (all bike count data comes from Transportation Services). 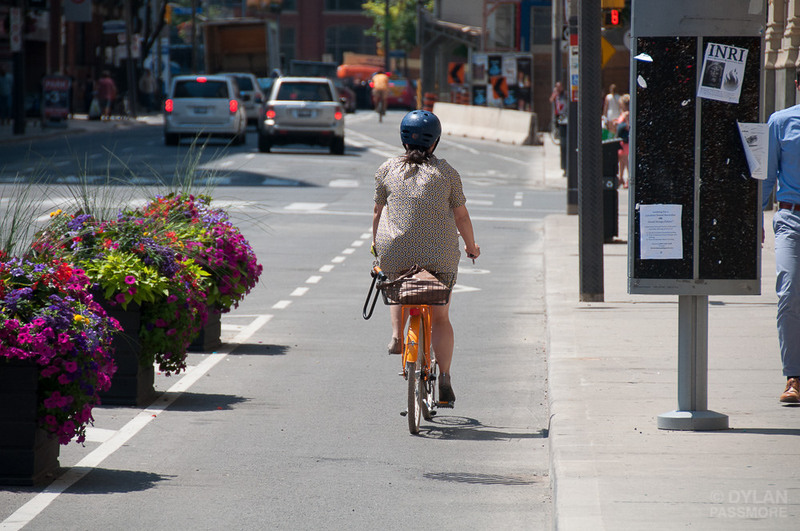 On a weekday afternoon on Simcoe Street last year June—a street that has protected bike lanes—there were around 240 per hour people on bikes right at the peak at 5pm. I did another count on a Monday morning. When comparing the weekday morning commute, Simcoe comes out ahead, but Strachan is not that far behind (and probably would be much better if it had protected bike lanes). We have so few opportunities to create a "grand boulevard" for cycling to the waterfront. Pretty much just Simcoe, Sherbourne and Strachan in the entire downtown. So let's not waste it. I'm sorry your mother cannot manage to keep a straight line with a five-foot accuracy but then I would suggest she shouldn't go cycling anywhere, including separated bike lanes. She'll just plow into a side boulder than or another cyclist. However, don't assume all mothers are similarly disabled. It's kind of insulting, actually. Richmond and Adelaide are much better than they used to be but a lot worse than they could be. Separation turns bike lanes into glorified sidewalks and increases confusion and collision potential at intersections. It makes passing a pain. It messes with snow removal. It gives people an illusion of safety while actually making their ride more dangerous and less convenient. Strachan is perfectly fine. One of my favourite streets to ride on, actually. Please don't ruin it by turning it into a "grand cycling boulevard for the grandly incompetent". Thanks. Luckily we're not building the city just for jerks like you. So clearly you're on the side of excluding whole categories of people who aren't able as you (and your mother I'm guessing). "Five-foot accuracy"?! Go get a tape measure and double check that. Bike lanes are a lot narrower than five feet wide. Then add in a huge truck with big wheels that's going twenty km over the posted 40 kph speed limit, and there's even less tolerance. I use Richmond and Adelaide every day. Passing has never been a problem (and I am pretty fast). Snow removal is a non issue (winter operations have to update their runbook and carry all ice off site). Safety is tremendously improved with separation - compare York to Yonge section of Adelaide with Church to Parliament - it is just a no brainer. Herb - great work on Strachan (and please ignore the troll).